The fruit of Citrus unshiu MARKOVICH used for various purposes in traditional medicine has various pharmacological properties including antioxidant, anti-inflammatory, and antibacterial effects. Recently, the possibility of anti-cancer activity of the extracts or components of this fruit has been reported; however, the exact mechanism has not yet been fully understood. In this study, we evaluated the anti-proliferative effect of water extract of C. unshiu peel (WECU) on human breast cancer MCF-7 cells and investigated the underlying mechanism. Our results showed that reduction of MCF-7 cell survival by WECU was associated with the induction of apoptosis. 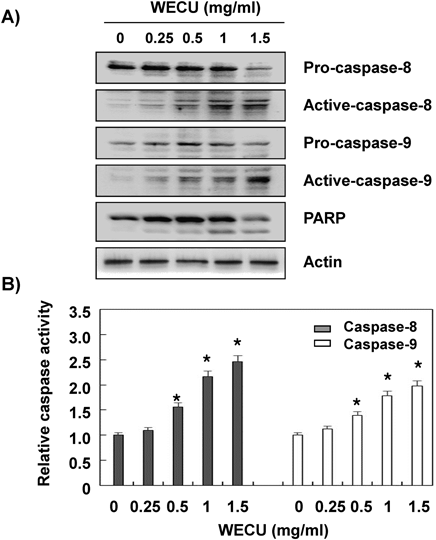 WECU-induced apoptotic cell death was related to the activation of caspase-8 and -9, representative initiate caspases of extrinsic and intrinsic apoptosis pathways, respectively, and increase in the Bax : Bcl-2 ratio accompanied by cleavage of poly(ADP-ribose) polymerase (PARP). WECU also increased the mitochondrial dysfunction and cytosolic release of cytochrome c. In addition, AMP-activated protein kinase (AMPK) and its downstream target molecule, acetyl-CoA carboxylase, were activated in a concentration-dependent manner in WECU-treated cells. 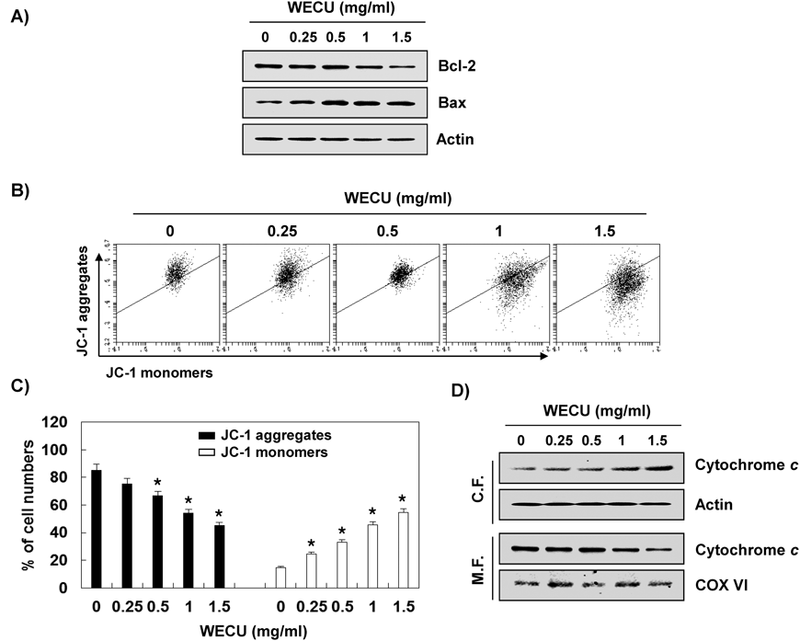 In contrast, compound C, an AMPK inhibitor, significantly inhibited WECU-induced apoptosis, while inhibiting increased expression of Bax and decreased expression of Bcl-2 by WECU and inhibition of WECU-induced PARP degradation. Furthermore, WECU provoked the production of reactive oxygen species (ROS); however, the activation of AMKP and apoptosis by WECU were prevented, when the ROS production was blocked by antioxidant N-acetyl cysteine. Therefore, our data indicate that WECU suppresses MCF-7 cell proliferation by activating the intrinsic and extrinsic apoptosis pathways through ROS-dependent AMPK pathway activation. In addition, such induction of apoptosis is complicated and is controlled by the activation and inactivation of various intracellular signal pathways involved in cell metabolism. One of the molecules of greatest interest recently in inducing apoptosis in cancer cells is 5′-AMP-activated protein kinase (AMPK), a serine/threonine kinase, that plays a critical role in the energy homeostasis of cell.7,8) AMPK is activated under conditions in which the ratio of AMP is increased compared to ATP depending on various environmental changes in the cell. It has an enzymatic activity to increase the cellular energy level when phosphorylation occurs in the α subunit (Thr 172 residue) among the three subunits (α, β, and γ) constituting AMPK.9,10) Recently, it has been reported that AMPK may play an essential role in the induction of apoptosis of cancer cells, and that excessive production of reactive oxygen species (ROS) stimulates AMPK activation.11,12) Although studies on the ROS generation and the role of AMPK are not fully understood, these results suggest that the AMPK may be a potential therapeutic target for inducing apoptotic cell death associated with mitochondrial function impairment. Plants that have been used worldwide for a long time in traditional medicine have been constantly reviewed as resources for the development of new drugs to control various diseases. In particular, herbal medicines contain a large amount of biologically active substances with little side effects and can be used as an alternative treatment strategy for prevention and treatment of various diseases including cancer.13,14) Among them, citrus and dried peels have been used as traditional medicines to treat common colds, bronchial discomfort, and indigestion and have been reported to possess pharmacological effects on inflammation, allergies, diabetes, and viral infections.15–19) A study using a tumor-bearing mouse model showed that Citrus unshiu MARKOVICH peel extracts inhibited tumor growth associated with increased cytokine production such as interferon-γ and tumor necrosis factor-α.20) According to a study by Kim et al.,21) C. unshiu peel has reduced the inflammation in tumor-bearing mice and prevented the production of pro-inflammatory and pro-cachectic factors in tumors associated with the prevention of skeletal muscle atrophy and weight loss. In addition, polysaccharides or flavonoids found in C. unshiu peels are reported to inhibit the metastasis of cancer cells.17,22) Recently, we have reported that ethanol extract of C. unshiu peel induces apoptosis through ROS-dependent caspase activity in T24 human bladder cancer cells23); however, the evidence for the anti-cancer effect of C. unshiu peel in human cancer cells and the underlying mechanism is still unclear. Therefore, we investigated the pro-apoptotic activity of the water extract of C. unshiu peel (WECU) on MCF-7 human breast cancer cells as part of the search for traditional medicinal products with anti-cancer activity. In this study, AMPK activation was found to be involved in the induction of apoptosis in MCF-7 cells by WECU, and this phenomenon is ROS production dependent. All tissue culture reagents including RPMI 1640 medium and fetal bovine serum (FBS) were obtained from WelGENE Inc. (Daegu, Republic of Korea). 3-(4,5-Dimethylthiazol-2-yl)-2,5-diphenyltetrazolium bromide (MTT), 5,5′,6,6′-tetrachloro-1,1′,3,3′-tetraethyl-imidacarbocyanine iodide (JC-1), N-acetyl-L-cysteine (NAC), and 4′,6-diamidino-2-phenylindole (DAPI) were purchased from Sigma-Aldrich Chemical Co. (St. Louis, MO, U.S.A.). Annexin V-fluorescein isothiocyanate (FITC) apoptosis detection kit and Bio-Rad protein assay kit were obtained from from BD Pharmingen (San Diego, CA, U.S.A.) and Bio-Rad Laboratories (Hercules, CA, U.S.A.), respectively. A mitochondrial isolation kit was purchased from Active Motif (Carlsbad, CA, U.S.A.). Colorimetric caspase assay kits and 2′,7′-dichlorofluorescin diacetate (DCF-DA) were obtained from R&D Systems (Minneapolis, MN, U.S.A.) and Molecular Probes (Leiden, the Netherlands), respectively. Primary antibodies were purchased from Cell Signaling Technology, Inc. (Danvers, MA, U.S.A.) and Santa Cruz Biotechnology, Inc. (Santa Cruz, CA, U.S.A.). Horseradish peroxidase (HRP)-conjugated secondary antibodies and enhanced chemiluminescence (ECL) kit were obtained from Amersham Biosciences (Westborough, MA, U.S.A.). All other chemicals not specifically mentioned here were purchased from Sigma-Aldrich Chemical Co. The dried peels of C. unshiu were provided from Dongeui Korean Medical Center (Busan, Republic of Korea) and identified by Dr. Su-Hyun Hong of Dongeui University College of Korean Medicine. A voucher specimen (WECU-17-1) has been deposited in the Department of Biochemistry, Dongeui University College of Korean Medicine. For the preparation of WECU, they were pulverized into a fine powder and then the powder was boiled with distilled water for 3 h. In order to remove insoluble materials, the extract was filtered through a 0.45-mM filter to remove insoluble materials, and the filtrate (WECU) was lyophilized using a vacuum rotary evaporator (BUCHI, Switzerland), and the residue was freeze-dried in a freezing-dryer, and then stored at −80°C. The extracts were dissolved in dimethyl sulfoxide (DMSO) to a final concentration of 100 mg/mL as a stock solution and stored at 4°C. The stock solution was diluted to the desired concentration in the medium before use. To confirmation the reproducibility of WECU, the phytochemical profile of WECU was analyzed using composition analysis based on HPLC using an Agilent 1100 series HPLC instrument (Agilent Technologies, San Jose, CA, U.S.A.) as previously reported.24) OptimaPak C 18 column (RS Tech Co., Daejeon, Republic of Korea) was used for chromatographic separation and gradient elution was carried out using deionized water and acetonitrile. HPLC were obtained using UV absorption at 190–400 nm. Standard samples mixtures including naringin, hesperidin, and neohesperidin were dissolved and diluted in methanol at 0.15–200 µg/mL, and the WECU sample was dissolved in methanol at 5 mg/mL. The results of representative sample chromatogram and quantitative analysis obtained from the experiments are shown in Fig. 1. The three reference components (A) and WECU (B) were analyzed using HPLC analysis. The quantitative data of WECU (C) for naringin, hesperidin and neohesperidin are indicated. Human breast cancer MCF-7 cells were obtained from American Type Culture Collection (Manassas, VA, U.S.A.), and were maintained in RPMI 1640 medium supplemented with 10% FBS, 2 mM L-glutamine, 100 mg/mL streptomycin, and 100 U/mL penicillin at 37°C in a humidified atmosphere with 5% CO2. To evaluate the cytotoxic ability of WECU, MCF-7 cells were seeded at a density of 2×104 cells per well in 6-well plates. After incubating overnight, the cells were treated with different concentrations of WECU for 72 h. Thereafter, a MTT solution was added to each well at a concentration of 0.5 mg/mL and then incubated at 37°C in a dark environment for 3 h. The MTT solution was removed carefully, and DMSO (200 µL) was added in order to dissolve the formazan complex. The cell viability was then detected by reading the absorbance of formazan at 540 nm using an enzyme-linked immunosorbent assay (ELISA) microplate reader (Dynatech Laboratories, Chantilly, VA, U.S.A.). The optical density of formazan formed in untreated control cells was used to show 100% viability. The morphological changes were also observed using an inverted light microscope (Carl Zeiss, Oberkochen, Germany). DAPI staining was performed to observe the chromatin condensation and nuclear fragmentation in the nucleus of apoptosis. After the treatment with WECU, the cells were harvested, washed twice with phosphate buffered saline (PBS), and fixed with 3.7% paraformaldehyde in PBS at 25°C for 10 min. The cells were washed with PBS and stained with DAPI solution (1 mg/mL) for 10 min. The cells were washed with PBS, and morphological changes of the nuclei were examined using a fluorescence microscope (Carl Zeiss). After the treatment with WECU, the cells were lysed, and a Bio-Rad protein assay was used to quantify the protein concentration as described in a previous study.26) At the same time, the mitochondrial and cytosolic fractions were isolated according to the manufacturer’s instructions a mitochondria isolation kit. For Western blot analysis, the same amounts of protein samples were electrophoretically transferred onto membranes (Schleicher & Schuell, Keene, NH, U.S.A.) following electrophoretic separation on sodium-dodecyl sulfate (SDS) gel. The membranes were blocked with PBS-T buffer [20 mM Tris (pH 7.4), 150 mM NaCl, 0.1% Tween 20] containing 5% skim milk. They were then probed with specific primary antibodies at 4°C overnight and reacted with the appropriate HRP-conjugated secondary antibodies for 2 h at room temperature. The protein bands were detected using an ECL kit as per the manufacturer’s instructions. The activities of the caspases (caspase-3, -8 and -9) were detected using colorimetric assay kits following the manufacturer’s instructions. In brief, the equal amounts of protein isolated from the cells to be analyzed were incubated with the supplied reaction buffer containing dithiothreitol and Asp-Glu-Val-Asp (DEAD)-p-nitroaniline (pNA), Ile-Glu-Thr-Asp (IETD)-pNA, or Leu-Glu-His-Asp (LEHD)-pNA as substrates for caspase-3, -8 and -9, respectively, at 37°C in the dark. After 2 h of reaction, the reactions were measured by changing the absorbance at 405 nm using an ELISA reader. Changes in the MMP were assessed using the dual-emission potential-sensitive probe, JC-1. After the treatment with WECU, the cells were collected, washed with cold PBS, and 10 µM JC-1 dye was loaded at 37°C in the dark. After 30 min, the cells were washed with PBS to remove the unbound JC-1 and the amounts of JC-1 retained by the cells were measured at 488 and 575 nm using a flow cytometer following the manufacturer’s protocol instructions. For the detection of intracellular ROS production, DCF-DA dye was used according to the manufacturer’s instructions.27) Briefly, after collecting the cells treated with WECU for a certain period of time, the cells were collected, rinsed with PBS, and then stained with 10 µM DCF-DA for 20 min at 37°C in a dark room. The cells were immediately washed and resuspended in PBS, and then analyzed for fluorescence intensity using a flow cytometer. The values are expressed as the percentage of fluorescence intensity relative to the blank control cells. To confirm whether intracellular ROS levels play any role in the cytotoxicity of WECU, the cells were pretreated with NAC, an antioxidant, for 1 h prior to the treatment with WECU. The results obtained by performing at least 3 times are expressed as mean±standard deviation (S.D.). Statistical analyses were performed using the SPSS statistical package (SPSS 13.0 for Windows, SPSS, Inc., Chicago, IL, U.S.A.). Differences between the two groups were analyzed by the two-tailed Student’s t-test, and between three or more groups by one-way ANOVA multiple comparisons. Statistical significance was considered as a difference of p<0.05. WECU and three reference compounds (i.e., naringin, hesperidin, and neohesperidin) were subjected to HPLC analysis. 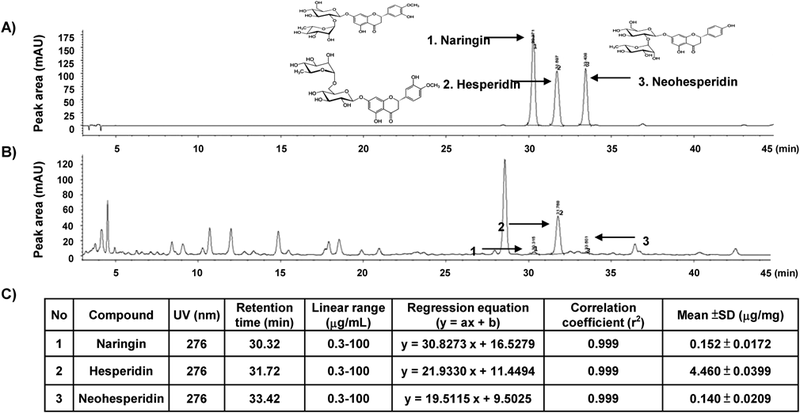 The histogram of WECU indicated that three types of flavonoid family chemicals were detected, including naringin, hesperidin, and neohesperidin at 30.32, 31.72, and 33.42 min of retention time, respectively. Quantitative analysis of the above chemicals was conducted, and their quantities were as follows: 0.152 (naringin), 4.460 (hesperidin), and 0.140 (neohesperidin) µg/mg (Fig. 1). As shown in Fig. 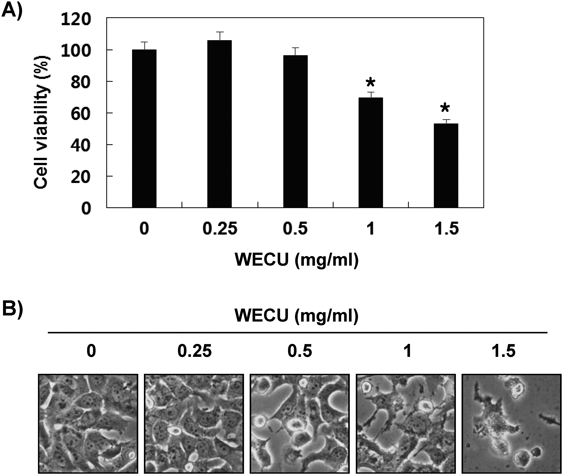 2A, WECU concentration-dependently reduced MCF-7 cell viability, with various cellular morphological changes including membrane blebs, decreased cell density, and increased number of unattached cells (Fig. 2B). To determine whether WECU treatment led to growth inhibition due to apoptosis induction, the effects of WECU on apoptosis induction was studied. The DAPI staining results indicated that nuclear division and chromatin condensation observed in typical apoptosis-induced cells was concentration-dependently increased in WECU-treated cells (Fig. 3A). And, the percentage of annexin V+/PI− and V+/PI+ cells markedly increased by treatment with WECU compared to that of the untreated control group (Fig. 3B). MCF-7 cells were treated with different concentrations of WECU for 72 h. (A) The cell viability was measured by an MTT assay. Data were expressed as the mean±S.D. of three independent experiments (* p<0.05 vs. untreated control). (B) The morphological changes of MCF-7 cells treated with WECU at various concentrations were observed under an inverted microscope (magnification, ×200). (A) After the treatment with the indicated concentrations of WECU for 72 h, the cells were stained with DAPI, and then the nuclei were observed under a fluorescence microscope (magnification, ×400). (B) The percentage of Annexin V-FITC positive cells cultured under the same conditions in the top (PI negative) and bottom (PI positive) right quadrant are indicated. Each point represented the means of two independent experiments. We next examined whether increased caspase activation is involved in inducing apoptosis in WECU-treated MCF-7 cells. The results of Western blot analysis showed that the expression of pro-caspase-8 and -9 apparently decreased with increasing WECU concentration, while their active forms increased (Fig. 4A). A subsequent increase in the cleavage of PARP, a representative substrate protein of activated effector caspases was also observed. Consistent with the immunoblotting results, the in vitro activity of caspase-8 and -9 significantly enhanced by the WECU treatment (Fig. 4B). MCF-7 cells were treated with the indicated concentrations of WECU for 72 h. (A) The equal amounts of cellular proteins were separated on SDS-polyacrylamide gels and transferred to PVDF membranes. The membranes were probed with the indicated primary antibodies, and the proteins were visualized using an ECL detection system. Actin was used as an internal control. (B) The activities of caspases were evaluated using caspases colorimetric assay kits. An example of representative results according to each treatment concentration is presented. Data were expressed as the mean±S.D. of three independent experiments (* p<0.05 vs. untreated control). Because mitochondrial dysfunction plays a crucial role in intrinsic apoptotic pathway, we next investigated whether the expression of Bcl-2 family proteins was altered by WECU. Among the Bcl-2 family proteins, the key factors controlling the function of mitochondria,1,6) Bcl-2 expression remarkably reduced in response to the WECU treatment, but the expression of Bax increased in the WECU-treated cells (Fig. 5A). The reduction of MMP associated with cytoplasmic release of cytochrome C is characteristic of activation of the endogenous apoptotic pathway. (A) After 72 h treatment with the indicated concentrations of WECU, the cellular proteins were separated by SDS-polyacrylamide gel electrophoresis and transferred to membranes. The membranes were probed with indicated antibodies and then proteins were visualized using an ECL detection system. Equal protein loading was confirmed by the analysis of actin in the protein extracts. (B) The cells were stained with JC-1 dye and then analyzed to evaluate the changes in MMP. An example of representative results according to each treatment concentration is presented. (C) Data were expressed as the mean±S.D. of three independent experiments (* p<0.05 vs. untreated control). (D) The cytosolic and mitochondrial proteins were separated by SDS polyacrylamide gel electrophoresis and transferred to membranes. The membranes were probed with anti-cytochrome c antibody. Proteins were visualized using an ECL detection system. Equal protein loading was confirmed by analysis of actin and cytochrome oxidase subunit VI (COX VI) in the each protein extract. Since the reduction of MMP and release of cytochrome c to cytosol are hallmarks of activation of the intrinsic apoptosis pathway,5,6) we further investigated whether this phenomenon is observed in the WECU-induced apoptosis in MCF-7 cells and found that WECU markedly destroys the integrity of the mitochondria measured by concentration-dependent decrease of MMP values (Figs. 5B, C). Subsequently, the cytosolic release of cytochrome c obviously increased upon treatment with increased concentrations of WECU (Fig. 5D). Many previous studies have reported that AMPK activation under stress conditions enhances cancer cell growth inhibition and apoptosis.8,12) Thus, we investigated whether WECU activates AMPK, which is reflected by increased phosphorylation of AMPKα and acetyl-CoA carboxylase (ACC), a downstream target kinase of AMPK. The Western blot results showed that WECU concentration-dependently increased the phosphorylation of AMPKα (Thr 172) as well as ACC (Ser 79) (Fig. 6A), indicating that AMPK was activated. The cells were treated with the indicated concentrations of WECU for 72 h (A) or pre-incubated with compound C, an AMPK inhibitor, for 1 h and then treated with 1.5 mg/m WECU for 72 h (B and C). (A and B) Equal amounts of cellular proteins were probed with the indicated antibodies and visualized using an ECL detection system. (C) The apoptotic cells were determined using a flow cytometer. Data were presented the mean of the two different experiments. Next, the effects of WECU on the levels of Bax and Bcl-2 after the pre-treatment of compound C, an inhibitor of AMPK, were investigated to address whether AMPK activation is involved in the intrinsic pathway for the death of MCF-7 cells induced by WECU. As indicated in Fig. 6B, expression changes of Bcl-2 and Bax decreased or increased by treatment with WECU were prevented in the presence of compound C (Fig. 6B). In line with these observations, the increased population of apoptotic cells was recovered by compound C (Fig. 6C). Because ROS is a known activator of AMPK,11,12) we further examined whether the induction of apoptosis and activation of AMPK is a ROS-dependent signaling pathway. The flow cytometry results using DCF-DA probe demonstrated that the ROS levels increased rapidly within 25 min after the WECU treatment and gradually decreased thereafter compared to the untreated cells. However, the WECU-induced increase in the ROS contents decreased by the addition of NAC, a ROS scavenger (Fig. 7A). (A) The cells were either treated with 1.5 mg/mL WECU for the indicated times or pre-treated with 10 mM NAC for 1 h before WECU treatment and then collected. The cells were incubated with new culture medium containing 10 µM DCF-DA at 37°C in the dark for 20 min. The production of ROS was measured using a flow cytometer. The data are the means of the two different experiments. (B and C) The cells were pre-incubated with 10 mM NAC for 1 h before 1.5 mg/mL WECU treatment. (B) After 72 h incubation, equal amounts of cellular proteins were probed with the indicated antibodies. The proteins were visualized using an ECL detection system. (C) The apoptotic cells were determined by a flow cytometer. The data were the means of the two different experiments. Therefore, we next attempted to investigate whether AMPK activation is related to the ROS generation, and ROS production is important for WECU-induced cytotoxic effect. As shown in Fig. 7B, the increase in AMPK phosphorylation by WECU was markedly reduced when artificially blocked ROS production by NAC, indicating that WECU-induced activation of AMPK is ROS dependent. 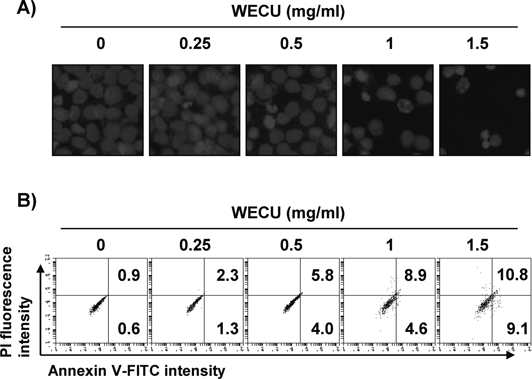 Furthermore, the WECU-induced apoptosis was significantly attenuated by the addition of NAC (Fig. 7C). As part of a screening program for identifying anti-cancer active ingredients in traditional medicines, a study was conducted on the mechanism of apoptosis induction by WECU, the ethanol extract of C. unshiu peel, in MCF-7 human breast carcinoma cells. The present results suggest that the activation of intrinsic as well as extrinsic apoptosis pathways may be involved in the induction of apoptosis of MCF-7 cells by WECU, and that ROS generation-dependent AMPK activation plays a critical role in this process. Because the AMPK activation is dependent on mitochondrial function, the loss of MMP following the WECU treatment in this study probably implies that mitochondrial function was impaired in the WECU-treated cells, presumably causing a problem in the intracellular ATP production.8,12) Many studies have shown that the AMPK activation by ATP depletion is directly associated with the apoptosis induced by various stimuli including chemotherapy agents.30–32) AMPK activation requires phosphorylation by upstream AMPK kinases and regulates the activity of various downstream targets including ACC that regulate cell fate.9,10) Therefore, we investigated whether there is a relationship between AMPK pathway and apoptosis of MCF-7 cells by the WECU treatment and found that WECU promotes the phosphorylation of AMPK and its downstream target ACC. However, blockade of AMPK activation by compound C suppressed the WECU-induced increase of Bax expression and the decrease of Bcl-2 expression. In addition, the degradation of PARP by WECU was also partially blocked, and the frequency of apoptotic cells also suppressed to a remarkable level. 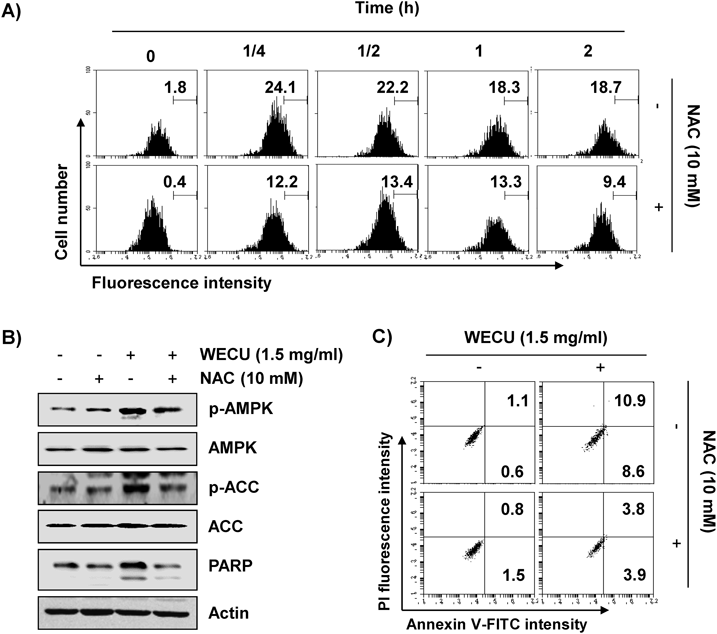 These data indicate that AMPK activation may be involved in the WECU-induced MCF-7 cell apoptosis, and AMPK is likely to act as an upstream regulator of intrinsic pathway involved in this process. With the activation of AMPK, the loss of MMP in the apoptosis induction process of cancer cells by various substances having anti-cancer activity is directly connected with the increase in the ROS generation. Many previous studies indicate that ROS acts as a powerful AMPK activator.11,12) Our results indicated that the ROS generation by the WECU treatment increased within 25 min of the WECU treatment and disappeared from MCF-7 cells cultured in medium containing antioxidant NAC. Furthermore, AMPK phosphorylation by WECU markedly suppressed under the conditions of inhibition of ROS production, the degradation of PARP was also attenuated, and the induction of apoptosis also markedly reduced. Although further studies on the inhibition of ATP production and related mechanisms of mitochondrial transport system disturbance are required, these data indicate that the ROS-dependent AMPK activation in MCF-7 cells is a major mediator of apoptosis, and ATP depletion due to mitochondrial damage by WECU probably induces AMPK activity. In addition to the AMPK pathway, many other intracellular signaling pathways are involved in cancer cell proliferation regulation. One of them is the phosphatidylinositol 3-kinase (PI3K)/Akt pathway, which has been reported to be overactive in many cancer tissues and has become a target for blocking cancer cell proliferation.33,34) Recently, we have reported that inhibition of ROS-dependent PI3K/Akt signaling is involved in the induction of apoptosis of T24 bladder cancer cells by ethanol extract of C. unshiu peel.23) Therefore, it is anticipated that the production of ROS may play an important role in the induction of cancer cell apoptosis by C. unshiu peel. The C. unshiu peel is composed of various compounds such as polyphenols, terpenoids and flavonoids35) and the anti-cancer potentials of them including the reference compounds (i.e., naringin, hesperidin, and neohesperidin) detected in this study are well known. Since these substances are not present only in C. unshiu peel, the pro-apoptotic effect of WECU in cancer cells is believed to be due to the overall effect of various substances contained in WECU. Thus, further investigation of the relevance of another intracellular signaling system and the identification of the major active compounds in the WECU should be undertaken in the future. In summary, our results demonstrate that WECU enhances apoptosis in MCF-7 cells through the activation of the intrinsic as well as extrinsic pathways by enhancing loss of MMP, the cytosolic release of cytochrome c, ROS generation and Bax/Bcl-2 ratio. 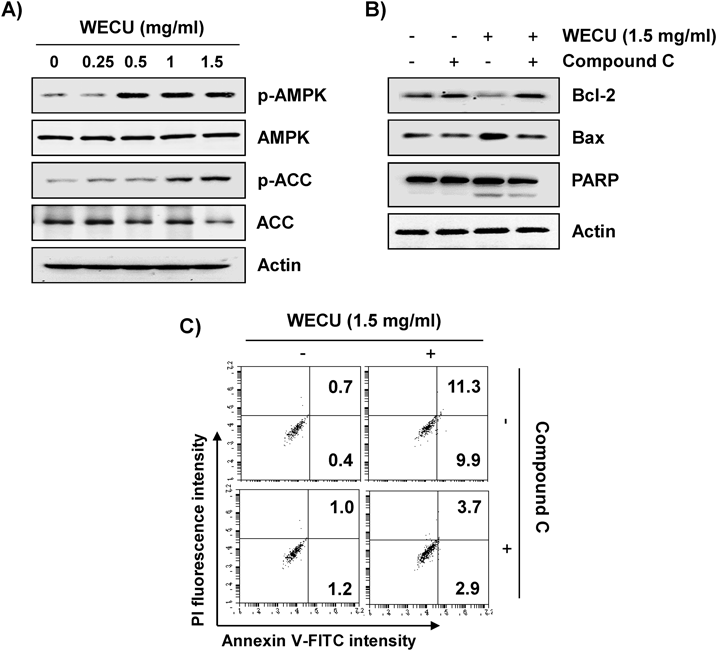 Furthermore, WECU promoted AMPK activation, and the inhibition of AMPK activity blocked the changes of Bax and Bcl-2 expression by WECU and prevented induction of apoptosis. In addition, when ROS production was blocked, WECU-induced AMPK activation and apoptosis in MCF-7 cells blocked, indicating that ROS is a potential upstream molecule of the cytotoxic effect induced by WECU. Although the search for active ingredients in WECU and their specific anti-cancer activity should be followed, the results indicate that WECU is an interesting natural compound with anti-cancer activity. This research was supported by the International Science and Business Belt Program through the Ministry of Science, ICT and Future Planning (2016K000297) and Basic Science Research Program through the National Research Foundation of Korea (NRF) Grant funded by the Korea government (2015R1A2A2A01004633). 1) Fulda S, Debatin KM. Extrinsic versus intrinsic apoptosis pathways in anticancer chemotherapy. Oncogene, 25, 4798–4811 (2006). 2) Nakajima YI, Kuranaga E. Caspase-dependent non-apoptotic processes in development. Cell Death Differ., 24, 1422–1430 (2017). 3) Hengartner MO. The biochemistry of apoptosis. Nature, 407, 770–776 (2000). 4) Kaufmann T, Strasser A, Jost PJ. Fas death receptor signalling: roles of Bid and XIAP. Cell Death Differ., 19, 42–50 (2012). 5) Tummers B, Green DR. Caspase-8: regulating life and death. Immunol. Rev., 277, 76–89 (2017). 6) Hata AN, Engelman JA, Faber AC. The BCL2 family: Key mediators of the apoptotic response to targeted anticancer therapeutics. Cancer Discov, 5, 475–487 (2015). 7) Kim J, Yang G, Kim Y, Kim J, Ha J. AMPK activators: mechanisms of action and physiological activities. Exp. Mol. Med., 48, e224 (2016). 8) Shackelford DB, Shaw RJ. The LKB1-AMPK pathway: metabolism and growth control in tumour suppression. Nat. Rev. Cancer, 9, 563–575 (2009). 9) Crute BE, Seefeld K, Gamble J, Kemp BE, Witters LA. Functional domains of the alpha1 catalytic subunit of the AMP-activated protein kinase. J. Biol. Chem., 273, 35347–35354 (1998). 10) Carling D, Sanders MJ, Woods A. The regulation of AMP-activated protein kinase by upstream kinases. Int. J. Obes. (Lond. ), 32 (Suppl. 4), S55–S59 (2008). 11) Liangpunsakul S, Wou SE, Zeng Y, Ross RA, Jayaram HN, Crabb DW. Effect of ethanol on hydrogen peroxide-induced AMPK phosphorylation. Am. J. Physiol. Gastrointest. Liver Physiol., 295, G1173–G1181 (2008). 12) Kaminskyy VO, Zhivotovsky B. Free radicals in cross talk between autophagy and apoptosis. Antioxid. Redox Signal., 21, 86–102 (2014). 13) Wang CY, Bai XY, Wang CH. Traditional Chinese medicine: a treasured natural resource of anticancer drug research and development. Am. J. Chin. Med., 42, 543–559 (2014). 14) Ming-Hua C, Bao-Hua Z, Lei Y. Mechanisms of anorexia cancer cachexia syndrome and potential benefits of traditional medicine and natural herbs. Curr. Pharm. Biotechnol., 17, 1147–1152 (2016). 15) Min KY, Kim HJ, Lee KA, Kim KT, Paik HD. Antimicrobial activity of acid-hydrolyzed Citrus unshiu peel extract in milk. J. Dairy Sci., 97, 1955–1960 (2014). 16) Park HJ, Jung UJ, Cho SJ, Jung HK, Shim S, Choi MS. Citrus unshiu peel extract ameliorates hyperglycemia and hepatic steatosis by altering inflammation and hepatic glucose- and lipid-regulating enzymes in db/db mice. J. Nutr. Biochem., 24, 419–427 (2013). 17) Park HR, Park SB, Hong HD, Suh HJ, Shin KS. Structural elucidation of anti-metastatic rhamnogalacturonan II from the pectinase digest of citrus peels (Citrus unshiu). Int. J. Biol. Macromol., 94 (Pt A), 161–169 (2017). 18) Suzuki M, Sasaki K, Yoshizaki F, Oguchi K, Fujisawa M, Cyong JC. Anti-hepatitis C virus effect of Citrus unshiu peel and its active ingredient nobiletin. Am. J. Chin. Med., 33, 87–94 (2005). 19) Oh YC, Cho WK, Jeong YH, Im GY, Yang MC, Hwang YH, Ma JY. Anti-inflammatory effect of Citrus unshiu peel in LPS-stimulated RAW 264.7 macrophage cells. Am. J. Chin. Med., 40, 611–629 (2012). 20) Lee S, Ra J, Song JY, Gwak C, Kwon HJ, Yim SV, Hong SP, Kim J, Lee KH, Cho JJ, Park YS, Park CS, Ahn HJ. Extracts from Citrus unshiu promote immune-mediated inhibition of tumor growth in a murine renal cell carcinoma model. J. Ethnopharmacol., 133, 973–979 (2011). 21) Kim A, Im M, Gu MJ, Ma JY. Citrus unshiu peel extract alleviates cancer-induced weight loss in mice bearing CT-26 adenocarcinoma. Sci. Rep., 6, 24214 (2016). 22) Jin H, Lee WS, Yun JW, Jung JH, Yi SM, Kim HJ, Choi YH, Kim G, Jung JM, Ryu CH, Shin SC, Hong SC. Flavonoids from Citrus unshiu Marc. inhibit cancer cell adhesion to endothelial cells by selective inhibition of VCAM-1. Oncol. Rep., 30, 2336–2342 (2013). 23) Ahn KI, Choi EO, Kwon DH, HwangBo H, Kim MY, Kim HJ, Ji SY, Hong SH, Jeong JW, Park C, Kim ND, Kim WJ, Choi YH. Induction of apoptosis by ethanol extract of Citrus unshiu Markovich peel in human bladder cancer T24 cells through ROS-mediated inactivation of the PI3K/Akt pathway. Biosci. Trends, 11, 565–573 (2017). 24) Lee JS, Kim HG, Han JM, Kim DW, Yi MH, Son SW, Kim YA, Lee JS, Choi MK, Son CG. Ethanol extract of Astragali Radix and Salviae Miltiorrhizae Radix, Myelophil, exerts anti-amnesic effect in a mouse model of scopolamine-induced memory deficits. J. Ethnopharmacol., 153, 782–792 (2014). 25) Lee PY, Park BC, Chi SW, Bae KH, Kim S, Cho S, Kang S, Kim JH, Park SG. Histone H4 is cleaved by granzyme A during staurosporine-induced cell death in B-lymphoid Raji cells. BMB Rep., 49, 560–565 (2016). 26) You MK, Kim HJ, Rhyu J, Kim HA. Pear pomace ethanol extract improves insulin resistance through enhancement of insulin signaling pathway without lipid accumulation. Nutr. Res. Pract., 11, 198–205 (2017). 27) Kim HB, Yoo BS. Propolis inhibits UVA-induced apoptosis of human keratinocyte HaCaT cells by scavenging ROS. Toxicol. Res., 32, 345–351 (2016). 28) Decker P, Muller S. Modulating poly(ADP-ribose) polymerase activity: potential for the prevention and therapy of pathogenic situations involving DNA damage and oxidative stress. Curr. Pharm. Biotechnol., 3, 275–283 (2002). 29) Hajra KM, Liu JR. Apoptosome dysfunction in human cancer. Apoptosis, 9, 691–704 (2004). 30) Garcia-Gil M, Pesi R, Perna S, Allegrini S, Giannecchini M, Camici M, Tozzi MG. 5′-aminoimidazole-4-carboxamide riboside induces apoptosis in human neuroblastoma cells. Neuroscience, 117, 811–820 (2003). 31) Hadad SM, Baker L, Quinlan PR, Robertson KE, Bray SE, Thomson G, Kellock D, Jordan LB, Purdie CA, Hardie DG, Fleming S, Thompson AM. Histological evaluation of AMPK signalling in primary breast cancer. BMC Cancer, 9, 307 (2009). 32) Ota S, Horigome K, Ishii T, Nakai M, Hayashi K, Kawamura T, Kishino A, Taiji M, Kimura T. Metformin suppresses glucose-6-phosphatase expression by a complex I inhibition and AMPK activation-independent mechanism. Biochem. Biophys. Res. Commun., 388, 311–316 (2009). 33) Brown JS, Banerji U. Maximising the potential of AKT inhibitors as anti-cancer treatments. Pharmacol. Ther., 172, 101–115 (2017). 34) Mayer IA, Arteaga CL. The PI3K/AKT pathway as a target for cancer treatment. Annu. Rev. Med., 67, 11–28 (2016). 35) Kim HG, Kim GS, Lee JH, Park S, Jeong WY, Kim YH, Kim JH, Kim ST, Cho YA, Lee WS, Lee SJ, Jin JS, Shin SC. Determination of the change of flavonoid components as the defence materials of Citrus unshiu Marc. fruit peel against Penicillium digitatum by liquid chromatography coupled with tandem mass spectrometry. Food Chem., 128, 49–54 (2011).